All experiments with configuration information, dataset are in the process of being standardized and made available at PAT website. The data is to show that PAT’s model checking library is highly optimized. Details about the experiments can be found in Post to Post Links II error: No post found with slug "experiments". PAT, so we can expect better and better performance in this module. The experiment data is available here. compare the result with PRISM. order to get better performance. The experiment data is available here. 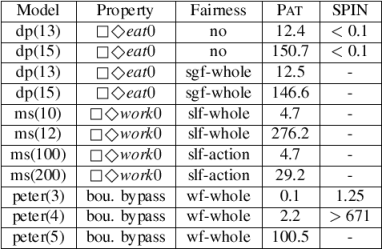 The following shows experimental results on embedded examples in CSP module to demonstrate the strength of PAT of handling various kinds of fairness constraints and verifying linearizability of concurrent data structure implementations. This part shows verification statistics to show power of PAT to handle fairness in comparison to SPIN. The verified benchmark systems consist of dining philosopher problem, Milner’s cyclic scheduler algorithm and Peterson’s mutual exclusive algorithm. Because of the deadlock state, the dining philosophers model (dp(N) for N philosophers and forks) does not guarantee that a philosopher always eventually eats (<> eat0) whether under no fairness or the strongest fairness. This experiment shows PAT takes little extra time for handling the fairness assumption. Notice that SPIN finds a counterexample (under no fairness) quickly. This is due to the particular order of exploration as well as its nested depth-first-search algorithm. Milner’s cyclic scheduler algorithm (ms(N) for N processes) is a showcase for the effectiveness of partial order reduction. We apply fairness in two different ways, i.e., one applying strong local fairness to the whole system (slf-whole) and the other applying only to inter-process communications (slf-action). In the latter case, partial order reduction allows us to prove the property over a much larger number of processes (e.g., 200 vs 12). Peterson’s mutual exclusive algorithm (peterson(N)) requires process-level weak fairness to guarantee bounded by-pass. The property is verified under weak fairness in PAT and process-level weak fairness in SPIN. PAT outperforms SPIN in this setting. The experiment data is available here. processes, ‘#Operations’ means the number of operations a process performs, ‘N/A’ means out of memory or more than two hours, and ‘Unlimited’ means a process executes operations in a loop. summary, PAT is effective and can handle millions of states in hours. The experiment data is available here. However, the checking process still suffers from state space explosion problem. or more than one hour. most cases. The computational overhead stems from two aspects.